Last week I went to ScotChain17, to discover more about the Scottish blockchain scene. Here is my recap. This is the second year of ScotChain, hosted by MBN Solutions in the conference centre at RBS Gogarburn. Paul Forrest from MBN introduced the event, which this year was focused away from FinTech and more towards CivTech and Health sectors. The first speaker was Paul Wheelhouse, the Scottish Minister for Business, Innovation and Energy, who described Scotland’s refresh of digital strategy and public service digital procurement, embracing new technologies like blockchain into the public sector. Alexander Holt then spoke on behalf of the Scottish Government, further describing the importance of public sector digital procurement through the government’s Digital Marketplace and GCloud. He discussed a desire to bring Scotland into line with the Tallin Declaration on eGovernment, and move towards single, secure, decentralised, citizen controlled identity management using blockchains, and away from traditional, insecure, centralised, multiple identity stores for government processes using passports and utility bills for citizen authentication. Peter Ferry from Wallet Services spoke next, and described their tendering of distributed ledger technologies (DLT) into the Scottish Government using Wallet Services’ blockchain-as-a-service platform. Existing user data and identity stores currently exist behind ‘walled gardens’ of centralised services, where identity and authentication mechanisms are duplicated between all public services and departments. BlockChain and DLT can provide ‘disclosure without exposure’ of citizens’ data, for example verifying financial liquidity or proof-of-age without actually exposing financial or personal details. Peter described their Super NodeTM BCaaS technology and their SICCAR solution for sharing citizen data across public sector services: travel visas, mortgages, licenses, etc. 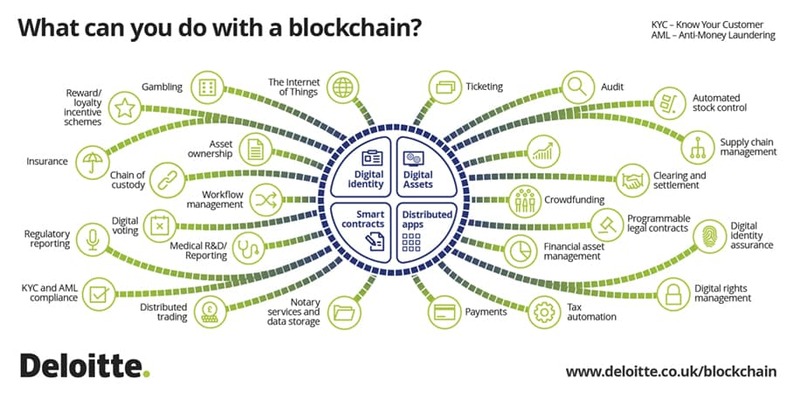 Kent Mackenzie from Deloitte described the growth of blockchain and Bitcoin over the recent past, and then introduced Ross Lawrie (known as Rosstradamus for his future prediction skills) who gave a brief overview of current blockchain use-cases with the ‘Blocktapus’ infographic. He then described his take on the potential future of DLT technologies, from revolutionising cashflow from 30 day invoice payment terms to ‘real-time’ spend, earn and taxation through micro-transactions, to crowd-sourcing solar installation funding and decentralised micro-energy trading. He described ‘directed acyclic graph’ blockchain designs for lightspeed proof-of-work consensus computing across connected systems. The quote from Arthur Schopenhauer – “Talent hits a target that no-one else can touch, Genius hits a target that no-one else can see” – gave everyone pause for thought. Next up, Professor Bill Buchanan gave an entertaining discussion on Trust, Identity, Smart Cities and Healthcare. An expert on cryptography and digital security, he was scathing about politicians lack of understanding of cybersecurity technology and threats, and he highlighted the deficiencies of HTTPS and SSL whilst pointing out the most police force websites have guides on online security but lack HTTPS certificates. He emphasised that the trust of the citizens is crucial to the development of data-based systems in healthcare, and organisations needed to put the citizen in charge of their own data and access, by bridging digital trust and human trust. He highlighted the London Health Information Exchange as a good example of this, and contrasted it with other, poorer public sector data exchanges. After lunch Paul Forrest hosted a vibrant discussion between Bill Buchanan, Ross Lawrie (Rosstradamus), David Birch, Angela Walch, Pawel Kuskowski from Coinfirm and Philippe Mayer from Avaloq, where topics ranged from blockchain highlights from the last 12 months, through the implications of upcoming GDPR compliance, to terminology and definition inconsistencies and the likelihood of blockchain technologies superseding traditional institutions or making them less relevant. Mark Simpson from RBS gave an interesting talk, ranging from the philosophy of blockchain, to the application of the various technologies. He mentioned a host of interesting DLT technologies – Ethereum, Ujo, Golem, Solarion, BigchainDB, RBS Emerald, R3 Corda DLT – and described when to and when not use blockchain as part of your solution. He ended with his opinion that Web 3.0 will comprise a host of collaborative blockchain technologies, using new protocols so disparate technologies can communicate with each other, and stated that there will not be one blockchain that rules them all, that no single DLT will win out but that there will be space for all. Angela Walsh from St. Mary’s University School of Law and UCL Centre for Blockchain Technologies lectured on Thinking Critically About Blockchain Technology. She cast doubt on the four ‘pillars’ of blockchain reputation; Immutability, Truth, Trustlessness and Security/Resilience and urged us to think critically and realistically about DLT in order to achieve an enlightened perspective, because “a realistic understanding is better than an idealistic understanding”. Next David Birch from Consult Hyperion, and an author of many blockchain books, gave a funny talk heaping scorn on some of the media hype and misunderstanding of blockchain technology. He described the four types of public and private blockchain solutions from a permission and consensus mechanism standpoint, and discussed why he thinks that the transparency of shared ledgers is an under-explored topic of blockchains which promotes ‘ambient accountability’. He thinks that ideas that save money on the regulatory side of DLT will have much more impact than those that save money on the financial side. Susan Ramonat from Spiritus Partners explored the opportunities and challenges of blockchain in healthcare, from a use-case, regulatory, geographic and technological stand-point. She dived deep into the classification of blockchain use-cases within healthcare using a clever framework around complexity, transaction, time and data aspects of use-case examples. Lastly, the winners of Hackchain17 presented their ingenious solution to authenticate online reviews with user reputation using a combination of public and private blockchains – very impressive for 2 days work from a team of six people – before Paul Forrest looked forward to next year and closed the event. From my point of view, it feels like the blockchain scene is now moving from simply identifying use-cases and opportunities to actually building working applications against real-world requirements. It will be interesting to explore some of the blockchain technologies in greater depth, and I look forward to working with clients on innovative blockchain projects.